A spectator shuffles a deck of cards and another spectator simply names any of the four suits. The magician retrieves the pack and then quickly cuts it into 10 piles. Amazingly, the first packet is counted and found to contain just one card! The second packet contains two cards, the third three cards and so on, all the way through to the last packet containing exactly 10 cards! 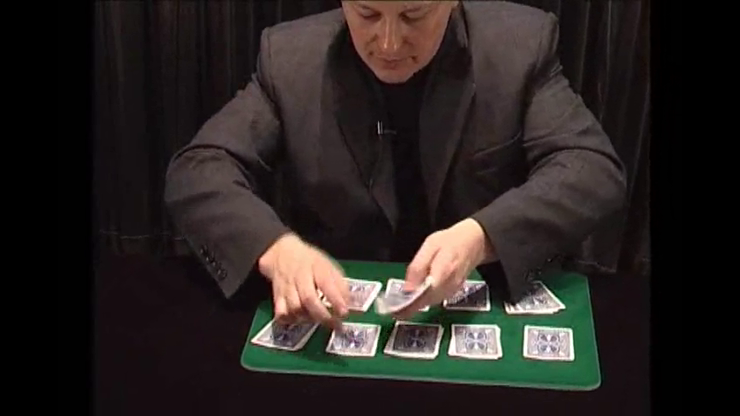 The top card of each packet is then turned over (remember the deck was shuffled by a spectator at the beginning), and assuming that the spectator chose Spades as the suit, the first card is the Ace of Spades. The card on top of the second packet is the Two of Spades, on top of the third packet is the Three of Spades and so on all the way through the rest of the packets! The Ace through Ten of Spades are then set aside and the deck is reassembled. The Jack of Spades is then found on top of the deck and the Queen and King of Spades are found on the bottom! The deck is then cut again, this time into three piles which are shown to each contain the thirteen cards of the remaining suits, in numerical order! Comes complete with the necessary deck of Bicycle cards and detailed instructions. This product was added to our catalog on Saturday 21 August, 2004. I just want the world to know it: THE BEST WORLD CUSTOMER SERVICE EVER!! !